Tired Out, Family Fund’s new sleep support service, is live and ready to support parents and carers of disabled children with sleep issues. 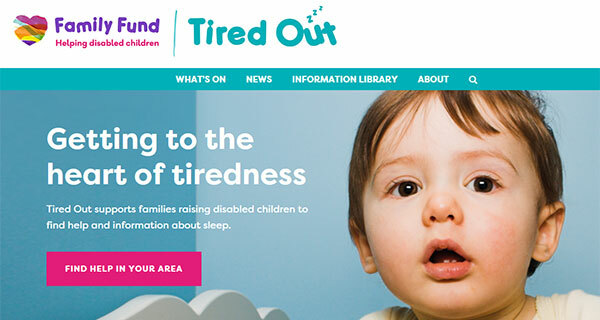 Tired Out aims to support families by pulling together all information and resource about sleep and putting it in one place. This includes information about UK-wide support available to families in their local area, useful sleep tips and a wide range of research, resources and stories from families themselves. In 2013, Family Fund, a national charity that helps families raising children with disabilities, gathered feedback from over 2,000 parents and carers across the UK about the impact of sleep difficulties on households. The subsequent report, 'Tired all the Time', revealed the startling findings that 93% of parents and carers were up in the night caring for their disabled child. Parents and carers reported how they experienced significant financial, social and emotional challenges as a direct result of not having enough sleep. They wanted to be listened to, heard and also be better able to access information and support. Following 'Tired All the Time', the charity made a commitment to do more and help families bridge the gap to a better night’s sleep. It has spent the last 18 months sourcing funding and working in partnership with leading organisations across the charity, disability and academic sectors to create Tired Out. These partners play a key role to keep the site content up-to-date and relevant to better support families raising disabled children and young people. The aim is to make it easier for all families with disabled children to find out what is available in their local area, as well as give useful tips and access to a wide range of resources, to provide a complete sleep support service. What does the Family Fund do? Family Fund is the country’s largest charity providing grants for families on low incomes raising disabled and seriously ill children and young people, supporting them to have the same opportunities as others. It does this by providing grants for essential items such as clothing, bedding, sensory toys, kitchen appliances computers/tablets, much needed family breaks and more. Last year, Family Fund provided 89,423 grants or services worth over £36 million to families across the UK. If you are bringing up a child, there may be benefits, grants or other financial support available to you. The ‘Bringing up a child' section of our website has information about ways you might be able to get help. You may also find it helpful to read our 'Illness, Injury and Disability' section and our 'Carers' section. Next Well done to the Turn2us runners in the GNR!